The US economy has stabilized, however Japan and the Eurozone are struggling as well as many emerging economies. Despite the record amount of global QE, investors are sitting in US dollars, treasuries and large caps rather than investing in new ideas especially in the resource arena. Higher risk capital entering start ups especially in junior mining has reached a new low as investors have been seeking liquidity and dividends rather than capital gains. Clearly, the strong global economy purported on CNBC has not yet been reflected on the TSX Venture Exchange yet. However, that may change over the next 3-5 years and now may be the time to buy up the best resource assets at historic lows when no one else is willing to buy them. Over the past decade, The TSX Venture has at least doubled or tripled from these historical low levels where it is currently trading. 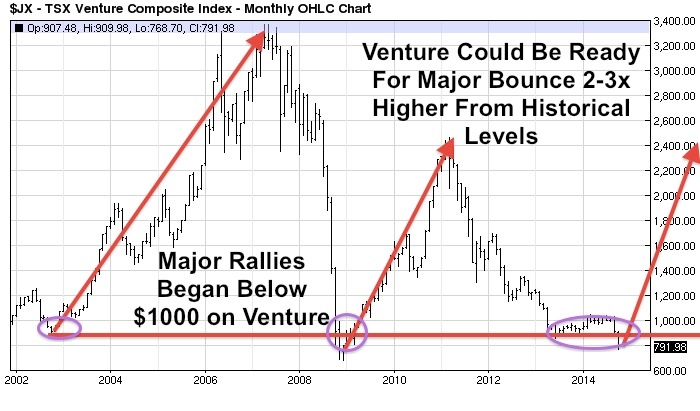 Major rallies over the past decade began when the Venture was trading below $1000. The Venture is trading at $790 as this is written. I wouldn’t be surprised to see a major bounce to the $2400 or $3400 level like it did back in 2009 and 2003. 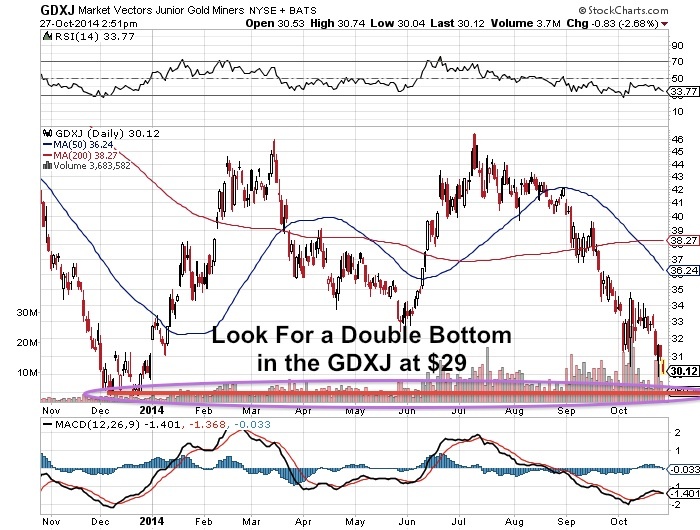 The Junior Gold Miner (GDXJ) ETF appears like it could be approaching a major bottom in the $29 zone and could form a double bottom with the December Low over the next couple of weeks. I just returned from the New Orleans Conference where I met with management of some exciting gold companies actively drilling and on the verge of major gains as they reach fundamental catalysts. I also met with strategic funds and investors who may be sensing a market bottom in the near term. Some of the smart money is looking for cash rich juniors with management that has been successful in previous bear markets. Strong shareholder support is crucial and they like to see insider buying from key shareholders and management. Major gold producers on the NYSE or top notch mining investors buying equity positions in some of these junior gold miners during these challenging times is an indicator of a potential winner. Seeing smart money make private placements during this selloff may indicate accumulation after capitulation. I am looking for companies fully permitted with high margin economics and a low capex in mining friendly jurisdictions. Stick to companies with either Preliminary Economic Assessments or Bankable Feasibility Studies demonstrating a reasonable capex, quick payback and low all in cash costs. This is not a time to sell and get caught up with the margin calls. This tax loss selling season could bring us excellent buys. Be selective and stick to the best juniors who are active, liquid and experienced to build value during challenging environments.